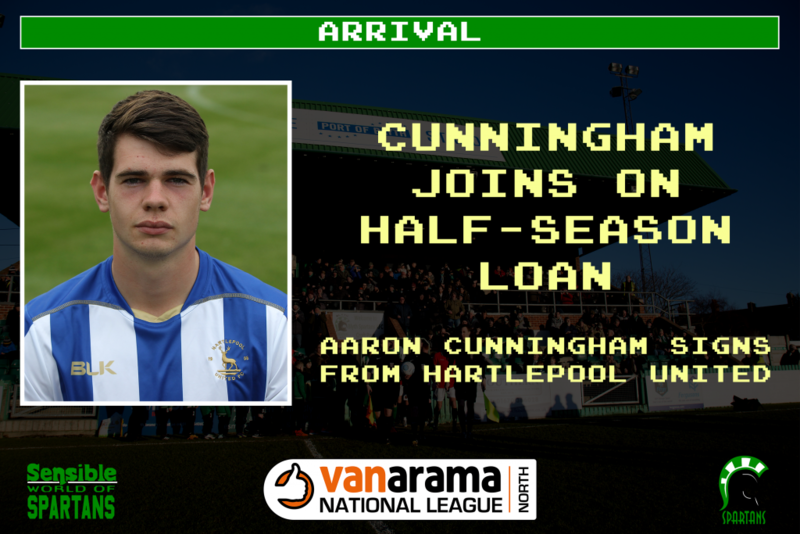 Blyth Spartans are happy to announce the loan signing of centre-back Aaron Cunningham from Hartlepool United. Cunningham, 20, joins the club until January 2019 and provides some much-needed cover at the heart of the defence with Jordan Watson still nearing full fitness and Ryan Hutchinson expected to miss the entire 2018-19 campaign. He played the full 90 minutes against Gateshead on Saturday, but will miss Spartans opening two games through suspension. Comfortable at centre-half or in a defensive midfield position, Cunningham has progressed through the youth academy at Pools before making his first-team debut against Torquay United in the National League on April 21, 2018. And the youngster is unlikely to forget his professional debut in a hurry as he was controversially sent off, 16 minutes after being introduced from the substitutes bench in place of Rhys Oates. Cunningham has shown signs of mental strength, too, having battled an ankle problem to earn a professional deal at Victoria Park in the final year of his three-year scholarship. Speaking on Saturday, Armstrong revealed he had been on a three-month long search for a centre-half – but was hopeful of drafting one in before the weekend. “We’re still looking for a few players ourselves – I think everyone knows that. I’ve been battling out for three months now trying to get a centre-half in.” Armstrong said at the weekend. “It’s just really difficult but I’ve got to keep going and hopefully I’ll get a couple in, in time for Saturday but it doesn’t give me much time to work with the lads. Cunningham becomes Blyth’s fifth summer addition of the summer by joining Alex Nicholson, Jamie Holmes, Kieran Green and Bradley Fewster at Croft Park.